Calvin and Hobbes by Bill Watterson is the greatest comic strip ever created. It somehow captures all of our imaginations while balancing adult themes such as war, death and love. One of the most iconic things about Calvin and Hobbes is the absolutely beautiful artwork by Bill Watterson. He has this way of capturing the ideal fall experience through the strip that makes you remember your childhood. 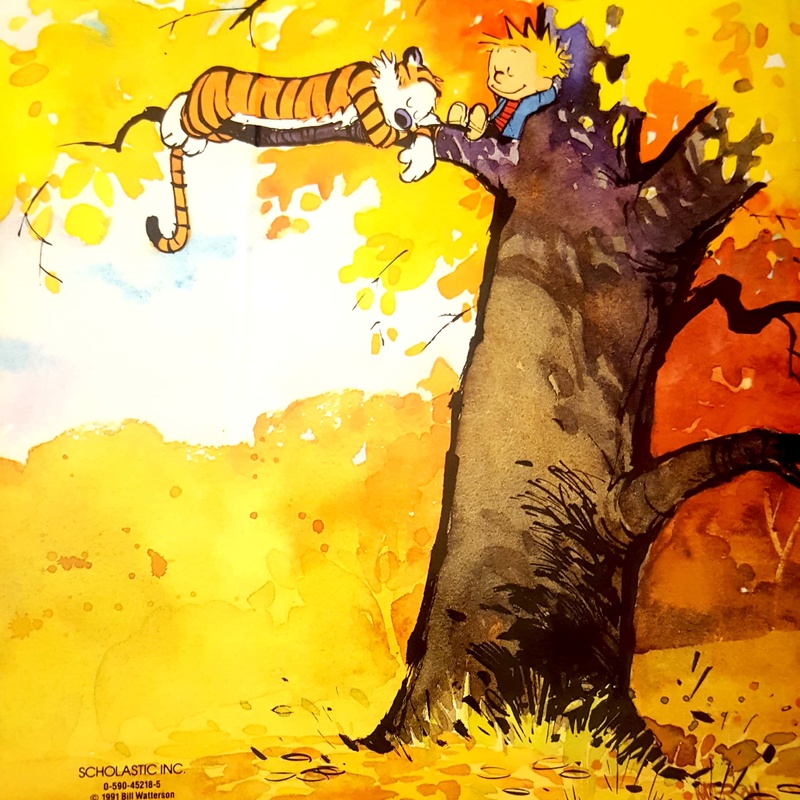 The funny thing is not a lot of us have experienced the watercolors of fall that Calvin and his buddy occupy. However, when we read the strips we feel like we’ve lived it. And that’s the beauty of Calvin and Hobbes. With wit and familiar scenarios, Bill Watterson gave us the definition of the Fall season. Here are my favorite C&H Fall time strips! We all had “the talk” by our parents after bringing home our well deserved loot. This is why I started to eat every bit of candy before heading home. Trick R’ Treating was always so sweet. If you haven’t pretended kitchen surgery to your jack-o-lantern than I know you’re lying. We all became doctor Halloweens dolor a few gooey moments! I remember dive bombing into piles of wet leaves just to disrupt the neatness of said pile. But when I read this strip all that changed. Suddenly the innocent pile of leaves turned into a mysterious monster. So my assault on the piles in my neighborhood increased in order to destroy this nefarious leafy beast. 4. Why did you say that?! I ways always that kid (still am) that would bring up or keep poking at scary things when the lights go out. After nearly dying from fright while washing The Exorcist I realized I love being scared. So I would often ask questions at the most inappropriate times. This is simply the sharp wit of Wattersons mind. A self aware Calvin nails adult humor. This is the ultimate vision of Fall. I do get a bit emotional when soaking this in. We all have our childhood memories of the past. We all have long lost friends and family that we shared such innocence with. And that’s what it is dear reader. This entry was posted in Review and tagged Bill Watterson, Calvin and Hobbes, Fall, halloween, October, Retro by Sad_Dracula. Bookmark the permalink.